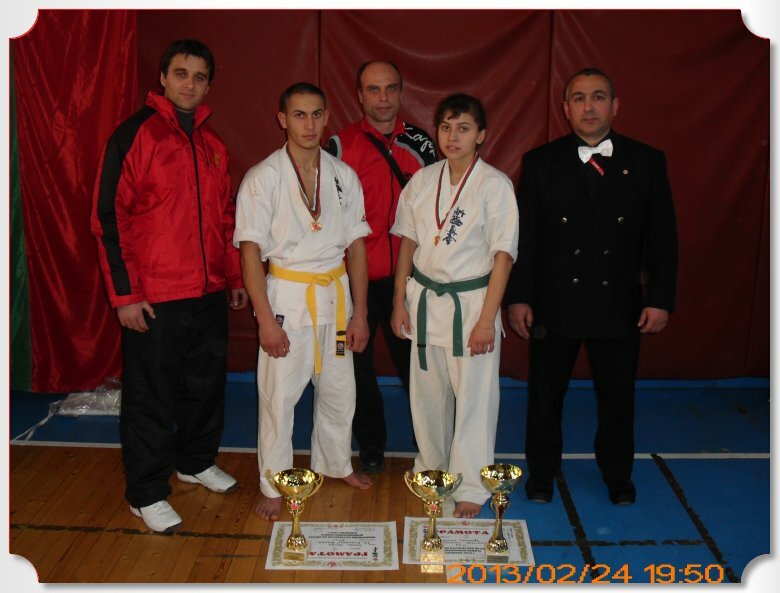 On 24.02.2013 in the "Dan Kolov" hall in Sevlievo took place the National competition in Shinkyokushin karate for juniors in kumite and kata. 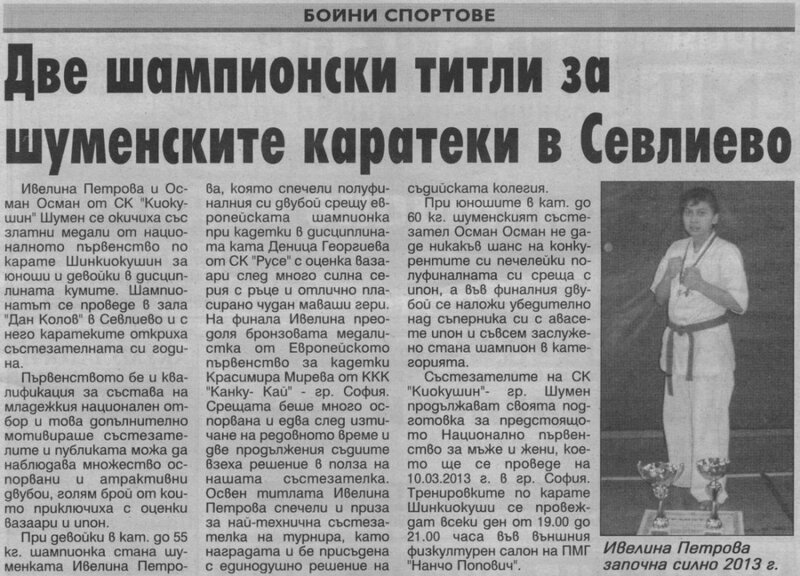 The event was organized excellently by the hosts of SC "Kyokushin" Sevlievo. This tournament was also a qualification for the junior national team - this was extra motivation for the fighters and the audience could witness many close and attractive matches, many of which ended by vazaari and ippon. The competitors of SC "Kyokushin" Shumen performed very well, winning 2 gold medals. In the girls 55kg category Ivelina Petrova won first place, winnig her semifinal against the european champion in kadets kata Denitza Georgieva of SC "Russe" with vazaari after a strong series of fist strikes and excellently placed chudan mawashi geri. In her final Ivelina overcame the bronze medalist from the european championship for kadets Krasimira Mireva of KKC "Kanku-Kai" Sofia. The match was very close and only after regular and extra-time ended did the referees make a decision in favor of our fighter. The same also decided to award the prize for the best technique to Ivelina Petrova. In the boys 60kg category the shumen karateka Osman Osman gave no chances to his opponents, winning his semifinal with ippon and his final he decisively won with avasete ippon, deservingly winning the gold. The competitors of SC "Kyokushin" Shumen continue their preparation for the upcoming National competition for men and women, which will be held on 10.03.2013 in Sofia. On 25.01.2013 SC "Kyokushin" Shumen was host to an exam for a higher level of technique /kyu/ in Shinkyokushin karate. This difficult endeavor was underwent by around 80 karatekas from Shumen, Novi Pazar, Veliki Preslav and Tzarev Brod, 65 of which were from Shumen. Shihan Georgi Popov - V dan / Technical director of the Bulgarian Karate Shinkyokushin Federation, coach of the National team for men and women and branch manager for Bulgaria /, sensei Valeri Dimitrov - III dan / two-time world and eleven-time european champion /, senpai Daniel Dimitrov - II dan, senpai Stoian Obretenov - II dan, senpai Ivan Bezus - I dan. The exam covered the three basic components of Shinkyokushin karate - kihon, kata and kumite, as well as an incredibly hard physical examination. All participants passed, showing great technical growth, strong fighting spirit and excellent physical preparation. At the end of next week Shumen's karatekas were the guests of SC "Bushido" Nesebar, where there was a combined training session for the competitors of Shumen, Nesebar and Burgas under the leadership of sensei Hristo Terziev - III dan / coach of the Junior National team /. THe event was focused on sparring and is a part fo the preparation of the three clubs' karatekas for the upcoming National competitions for juniors, men and women, with which starts the Bulgarian Karate Shinkyokushin Federation's sports calendar. Time flew as training went by in friendly spirit and hearty atmosphere. The instructors and competitors of the clubs exchanged valuable experience and everyone wished eachother luck on the tatami during the new competitive year. 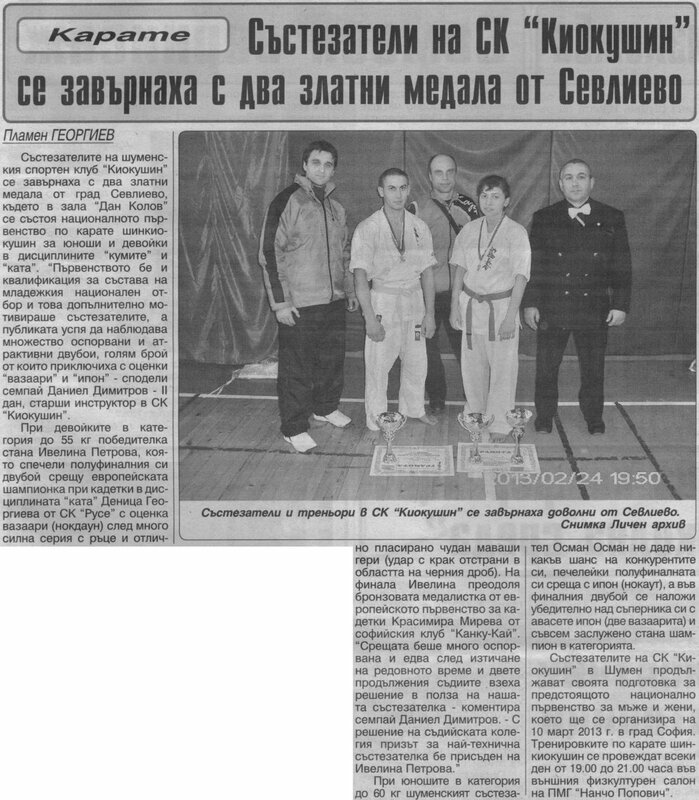 On 12.01.2013 in Novi Pazar took place a kumite seminar in Shinkyokushin karate for men and women, seniors and kadets, in which participated the competitors of SC "Kyokushin" Shumen and its branches in Veliki Preslav and Tzarev Brod, SC "Kyokushin" Novi Pazar and SC "Russe" Russe. During the first of the two training sessions for the day the competitors were divided by age groups and categories and the focus was on sparring and conditional fight. During the second the young talents of the clubs of norhteastern Bulgaria worked mainly on combinations of sparring technique in twos and with gear, also noting on main aspects of physical conditioning. The kumite seminar was lead by sensei Rumen Kalinov - III dan, senpai Daniel Dimitrov - II dan, senpai Stoian Obretenov - II dan and senpai Ivan Bezus - I dan. Training went by in friendly spirits and hearty atmosphere as time flew by. The instructors and competitors of the clubs exchanged valuable experience and everyone wished eachother luck on the tatami during the new competitive year. The competitors of SC "Kyokushin" Shumen continue their preparation for the upcoming National competitions in Shinkyokushin karate for seniors, men and women, with which starts the sports calendar of the Bulgarian Karate Shinkyokushin Federation.